SoyBase database was established in the 1990s as the USDA Soybean Genetics Database. Originally, it contained only genetic information about soybeans such as genetic maps and information about the Mendelian genetics of soybean. In time SoyBase was expanded to include molecular data regarding soybean genes and sequences as they became available. In 2010, the soybean genome sequence was published and it and supporting gene sequences have been integrated into the SoyBase sequence browser. SoyBase genetic maps were used in the assembly of both the Williams 82 2010 assembly (Wm82.a1.v1) and the newest genome assembly (Wm82.a2.v1). SoyBase also incorporates information about mutant and other soybean genetic stocks and serves as a contact point for ordering strains from those populations. As association analyses continue due to various re-sequencing efforts SoyBase will also incorporate those data into the soybean genome browser as they become available. Gene expression patterns are also available at SoyBase through the SoyBase expression pages and the Soybean Gene Atlas. Other expression/transcriptome/methylomic data sets also have been and continue to be incorporated into the SoyBase genome browser. Soybean [Glycine max (L.) Merr.] is a major food crop. The bean is a native of Asia and has been cultivated for centuries in China and Japan. In the US, more than 83 million acres were planted in soybean. Total production is more that 3 billion bushels with more than 1.7 billion (56% of 2013 total US production) bushels exported to the world at an estimated value of $28 billion dollars. The crop is grown in the Midwest along the Mississippi River and along the Atlantic Seaboard from Florida to New York and as far north as Ontario, Canada. The bean is known by various names throughout the world such as soy, soya, and soy bean. 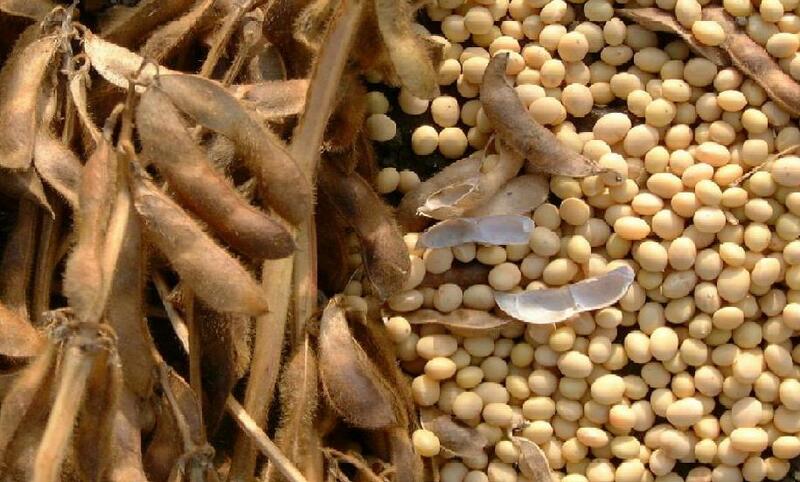 Soybean can be allowed to mature and the pods and seed dried to 13% moisture for harvesting and processing for oil and meal. Soybean oil has many culinary uses and the de-fatted meal is also incorporated in many food and industrial processes. Soybean meal is also processed into many animal feeds including fish, pork, beef and chicken feeds. The bean is typically >30% protein and ~15% oil by weight making it comparable to peanut in terms of nutritional value. Soybeans are also eaten as green pods and seeds known as edamame or vegetable soybean. 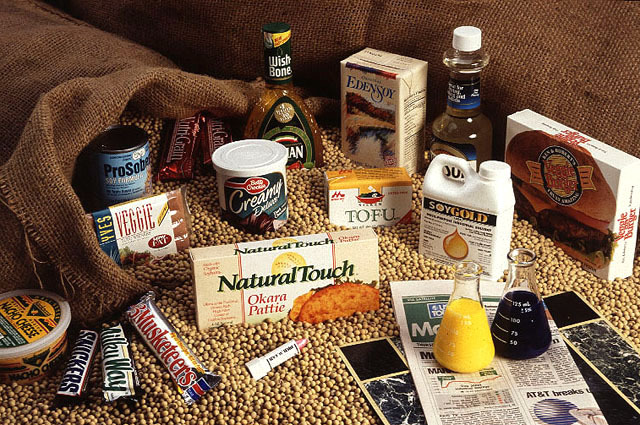 Soybeans can be made into many food products such as soy milk and tofu. Soy milk is prepared by hydrating dried soybean seeds in water and grinding them into a paste which is diluted into a milk-like consistency. Tofu or bean curd is the result of coagulating the soy proteins in soy milk in a manner similar to making cheese from cows milk. 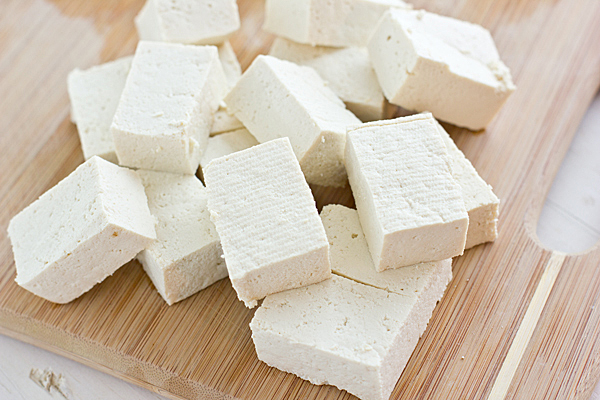 Tofu can be prepared (flavored) in many ways to produce the final product that is used in different cultures cuisines.